The current season presents a fantastic opportunity to maintain your garden due to the relatively calmer conditions. With no harsh sun or excessive rain, it’s a perfect time to go through your garden maintenance checklist. Today, we’ve prepared a gardening to-do list for you to check before winter hits. Generally, the sun is not overbearing in autumn and in a sheltered spot, the wind is not as powerful. These are ideal conditions for growing plant cuttings. Take 10cm cuttings of your favourite herbs, for example. Remove the lower leaves and place the cuttings in a moist potting mix. Ensure the pot is in an area of your garden that is relatively sheltered from the elements. While autumn leaves may look beautiful for a photo, they can make your garden look messy. This is a perfect opportunity to use your compost bin to clear up the clutter, especially since you can use the resulting compost to keep your soil healthy. Try to set aside some time once a week to clear up the autumn leaves. Trimming your hedges and pruning your trees are jobs that need doing in order to maintain the health of your plants. Early in autumn is the perfect time to do this because bare branches can make the pruning job easier to navigate. You should take extra care to note which plants you should prune in autumn, as some may already be setting their spring buds and you don’t want to compromise their blooming. Autumn is a good time of year to fertilise your lawn because doing so helps to keep the grass lush and green during winter. This is because the roots are still growing well even though the grass growth has slowed due to colder weather. Therefore, fertilizing encourages healthy root growth and a thick lawn. 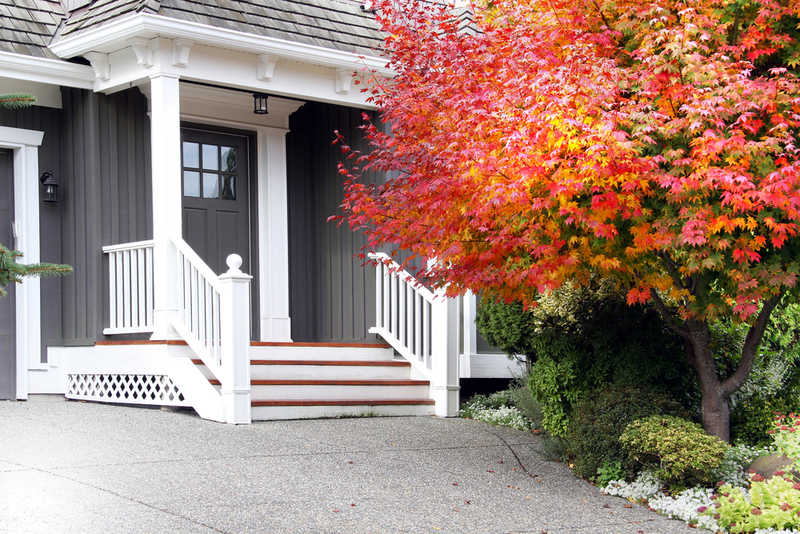 Another reason to clear away autumn leaves and debris is because they can stain your driveway. The condensation, combined with fallen debris and constant traffic, makes it very easy to stain your concrete driveway especially if the leaves are left there. To help prevent staining, you should look into sealing your driveway – particularly if you aren’t sure when you sealed it last. A Better Driveway specialise in a range of concrete services including exposed aggregate driveways, textured concrete driveways and coloured concrete driveways. We can help with your driveway project from start to finish – from giving you seasonal maintenance advice for your driveway, to helping you understand the concreting process.